I used to right-click on Desktop and get a menu that allowed me to create a New Folder. Now I do not get that option, but instead it lists Briefcase. How do I retore New Folder option? Or you can type rstrui into the search box and hit enter. Your choice. 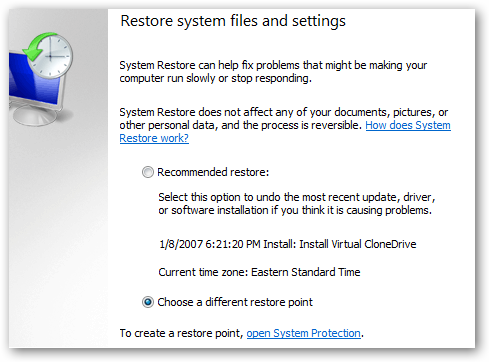 If you do choose a different restore point, you will see a list of restore points that you can choose from. How many times have I typed the word choose at this point? You’ll notice in the screenshot below that the last thing I did was install Virtual CloneDrive to mount ISO images, but right before that I installed the NVIDIA drivers. When you go back essentially it would only change data that was saved in the registry and updates and not any of your files \ programs. What items are you worried about ? Sorry for delay. I lost contact when I checked retore options. If I go back to earliest restore point, it says I will have to re-install several programs. That's why I hesitate to do that. Lets look and see what it says in the registry. If you are weary of changing the value you can always make a backup copy of the registry prior to doing so. Do I just copy and paste this value in the Registry? Did not change the right-click menu. It's same as before..
OK, lets try a restart and see if it helps. No change in right-click menu after re-start. Any thing else? Can you check the registry again and make sure the value is not blank again but rather what we had entered earlier ? Value is exactly the same as entered before. OK one more step to do on top of this one. Can not download file. I have to go now. No more time to do anything more. What is the problem that you are having downloading the file? Received message with download.. DO NOT ADD THIS TO RGISTRY. Clicked NO when asked if I wanted to continue without further information from you. Changes to Registry did not work and I don't want to continue. This was a 7-day Free Trial. Please cancel and refund any charges made to my Credit Card. how do I get programs and features to my program files i.e. The briefcase on my laptop has changed into a regular folder.